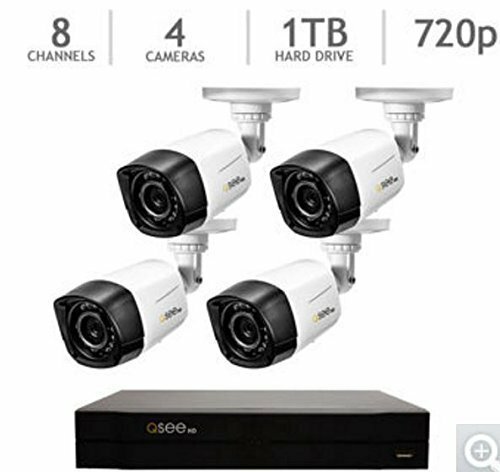 This analog surveillance setup rests at the lower end of the spectrum for cameras and networks provided by Q-See, a fact which is reflected in its comparatively low price tag. 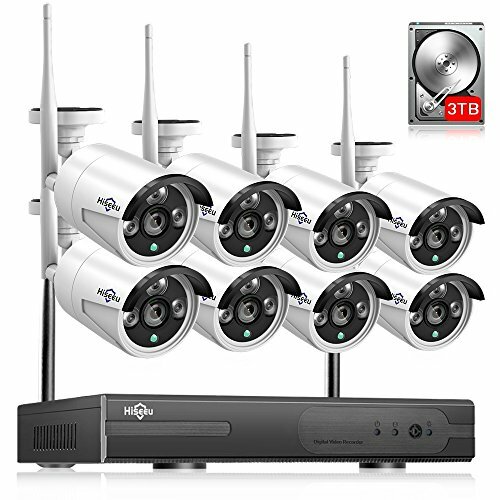 For fewer than three-hundred dollars you’ll receive four HD indoor/outdoor bullet cameras and an 8-channel HD DVR with 1TB of ready-to-go storage. 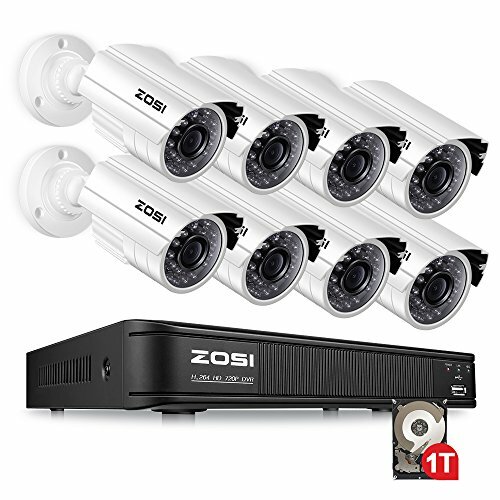 Alongside the DVR and cameras themselves, the full package you’ll receive contains: a USB mouse, DVR power supply, HDMI and Ethernet cables, sixty feet of video cable, camera power supplies, mounting screws, and warning labels. You’ll only be getting four cameras despite the DVR allowing up to eight channels, so there’s an option for adding to your network with the purchase of additional cameras. Unlike IP cameras at the higher end of the market, these bullet cameras will need to be wired separately for power and data transmission. Even so, use of a wired connection still guarantees a steadier, more reliable transmission rate than wireless solutions, which are subject to Wi-Fi signal and packet loss. As this is a QCN solution, you’ll also benefit from the free app, which is available on iOS, Android and Windows and will help you monitor and control your cameras remotely. If you’re controlling from a computer, then you’ll have no trouble operating these cameras on slightly older systems, as they’re supported all the way back to windows XP and Vista. The devices are well crafted and the casings offer decent protection against the elements; despite this they’re not as bulky as some of Q-See’s other offerings, which means they’re a little more suited to indoor or private residential use. While the picture quality of an analog system like this one will always be inferior to newer, more expensive internet protocol devices, these cameras offer a decently clear image in 720p and come with a fair array of features considering their position in the price bracket. Once installed the bullet cameras boast an effective night vision range of up to eighty feet, and stream constantly to the included DVR. The cameras have a 3.6mm lens and a 65-70° field of view. If you’re willing to compromise, there’s also an option to record at 1080p at a lower framerate, which can prove useful depending on your surveillance needs. As with other QCN products, accessibility is one of the key selling points of this system; using the mobile app customers can access their stored data to search for and play back recorded video. Important to note is that app functionality is limited compared to other, higher-end cameras. There is no option to pan, tilt, or zoom, and with no backlight compensation you’ll have to think a little more carefully about lighting in the areas you’re hoping to survey. Q-See’s ‘Scan n’ View’ option allows you to use your mobile’s QR code reader to gain quick access to your feed. 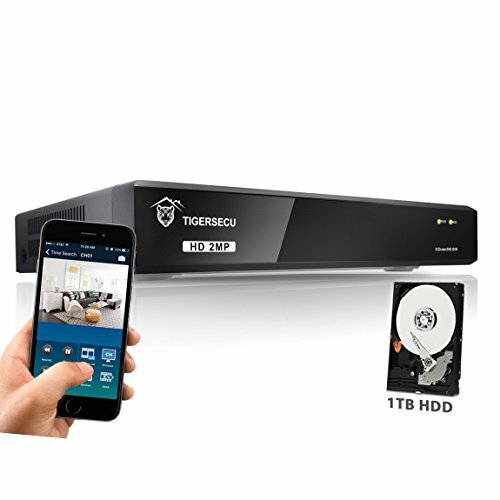 As with most systems of this kind, the Q-See DVR comes with proprietary software and a guided start-up wizard, which makes installation relatively stress-free. You’ll get an opportunity to configure your cameras at this stage, but most important details can be adjusted later as the need arises.You can set up three recording modes depending on your needs: manual, schedule and motion detection. These are useful features to have, particularly on an analog system, and the option of remote monitoring means you have constant access to what your cameras are seeing – when they’re seeing it. Because the image is processed and compressed at the DVR itself rather than the camera, there’s little to no delay when you’re viewing the image. 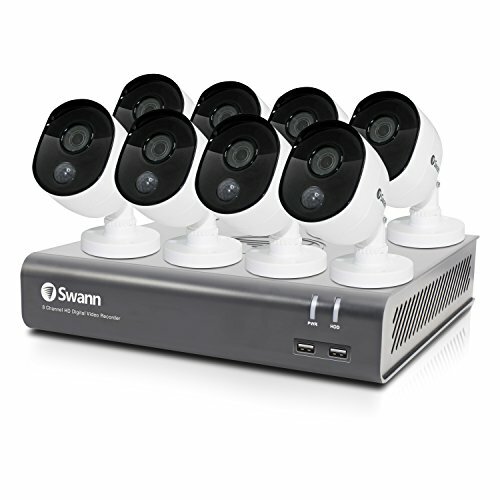 IP cameras, despite being more expensive, often have viewing ‘lag’ of up to two seconds. Analog surveillance tends to perform better in inclement weather or under the strain of constant usage. Where PoE protocol cameras often require maintenance of the cabling and are very network-dependent, the relative simplicity of analog networks means breakages or malfunctions are correspondingly easier to diagnose and fix. Analog cameras also perform better in low-light settings, and the inclusion of night vision with infrared LEDs means you’ll get decent performance during the small hours.Your purchase here will get you 1TB of internal storage for your DVR, provided by Western Digital. Like almost everything provided, the drive is fairly robust and stands up fairly well to constant use. One of the advantages of using an analog system, however, is the interchangeability of storage and recording devices. The DVR itself supports hard drives up to 4TB and you’ll have little trouble using branded USBs or external drives with this system. Reviews of this product tend to focus on accessibility, with customers praising the functionality and responsiveness of the Q-See app, and the absence of a delay when viewing their feeds in real time. Though the cameras themselves aren’t too sizeable, the DVR is fairly big and can be somewhat noisy, so consider this when choosing where to install your control centre. Cooling is a must, so owners recommend darker, well-ventilated areas for storing your setup. While well-constructed and reliable, installation of the cameras themselves can be hindered somewhat by stiff or slightly misaligned ports. Easy set-up is a common theme, with Q-See products being described as ‘plug-and-play’. 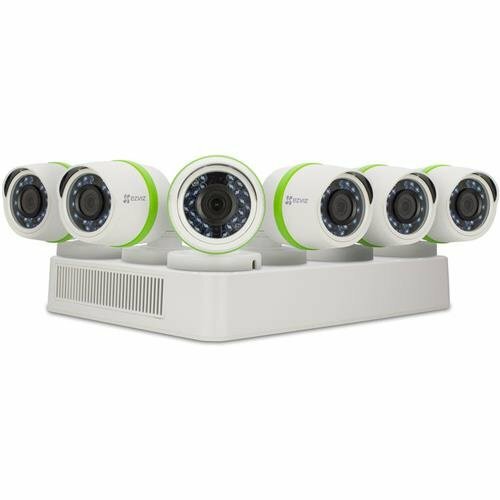 This system delivers exactly what you’d expect from a competitively-priced analog surveillance solution: easy installation, reliability under constant use, easily adjustable storage, and a stable, medium-quality image. Added bonuses you’ll be getting with this purchase are LED-assisted infrared night vision and customisable recording modes. When not in night mode the cameras record in full colour, though no sound is available. Once you receive them, the devices will hold recorded footage for up to three months, meaning once they’ve arrived you won’t have to immediately begin worrying about purchasing extra storage.